New Jersey ? 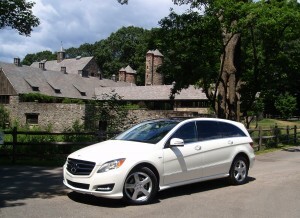 The answer is: ?The Mercedes-Benz R-Class.? The question is: ?What vehicle has the universal appeal of a sport utility vehicle and the performance of a sedan?? The only problem is most new car shoppers are asking the question and buying some other luxury crossover or SUV, instead of an R-Class, which is too bad, because the R-Class is a really good answer.? Fortunately, Mercedes is giving the R-Class another try.? Totally redone for 2011, the R-Class has made evolutionary design changes, so at first glance, it might not look new but comparing the old and new you can see significant improvements. R-Class interior configurations allow comfortable seating for up to seven, but the interior is easy to reconfigure for various combinations of passenger seating and cargo carrying.? When the need arises, the cargo space can expand to 85 cubic feet.? I especially liked the five-seat configuration with the larger cargo space and the extra storage space under the floor. 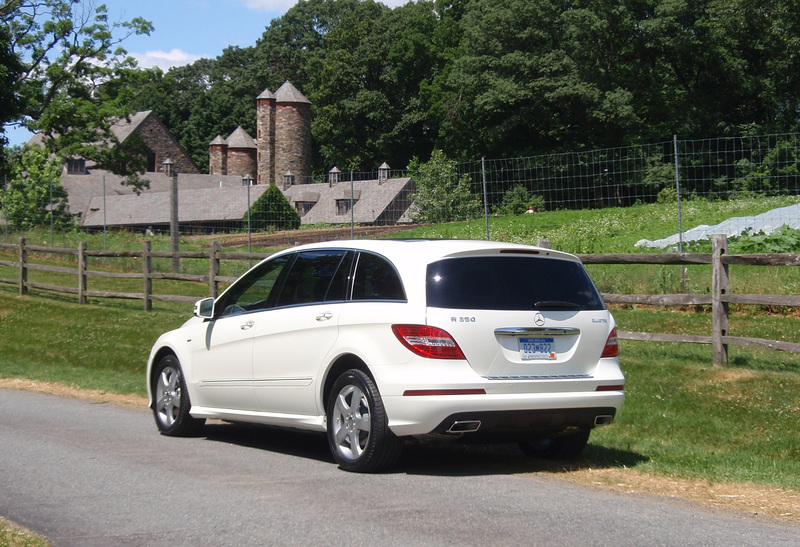 Like all Mercedes vehicles, the R-Class is driver oriented first, but with a heavy emphasis on luxury, passenger comfort and safety. Driver controls center around the steering wheel with the Mercedes short shifter stalk on the column and the wheel-mounted shift paddles to control the seven speed automatic transmission.? The paddles make manual gear changes easy and quick.? The wheel-mounted, multifunction controls on the upper spokes of the four-spoke steering wheel allow the driver to cycle through a multitude of functions displayed on the small screen mounted between the tachometer and speedometer without removing hands from the wheel.? Climate, navigation and audio controls, which are all mounted in a panel in the center of the dash, are convenient from either front seat. U.S. model engine choices include a 268-hp, 3.5-liter gasoline V-6 and a 210-hp, 3.5-liter Blue TEC diesel.? The diesel produces a whopping 400 lb.ft. of torque compared with the 258-lb.ft from the gas engine, but the additional torque makes the diesel feel more powerful. The gas engine accelerates from 0 to 60 mph in 8.0 seconds and the diesel in 8.6 seconds. ?By sound alone, it was difficult to tell if I was driving the gas or diesel engine. ?Previously the R-Class was offered with V-8 engine options, including a 6.3-liter AMG model, but the new offering is much more simplified and family minded. Both engines are available in the standard rear wheel drive, or the optional 4Matic all-wheel drive system.?? EPA fuel economy estimates are 18 mpg city and 24 highway for the diesel and 14 mpg / 19 mpg for the gas. Driving both models through the forests northwest of New York City, the R-Class displayed a smooth quiet ride, with an emphasis on comfort and luxury more than performance, which is more appropriate for a vehicle of this type.? There is a little body roll on the corners, but the car felt well controlled even when going into a corner a little too fast.? The brakes are strong and straight with little dive during harder braking. The R-Class has a full arsenal of safety equipment including the PRE-SAFE? system with a complete restraint system of eight airbags, crash-responsive active front head restraints, and a tire pressure warning system.? Driving in heavy New York area traffic, I especially appreciated the Blind Spot Assistance that warned me when a vehicle was in my blind spots.? Other safety features include the reversing camera and the Distronic cruise system that kept the R-Class a constant distance from the vehicle ahead. 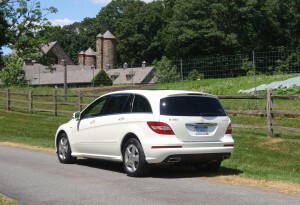 To me, the R-Class is a vehicle that should a be big success.? The styling is good, the layout is easily configured for a multitude of family applications, plus it is comfortable, safe and a good value, with pricing expected to start at about $50,000.? Perhaps this time around the R-Class will find a niche in more garages.